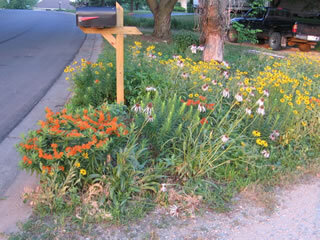 I've created various garden types in my yard located in Topeka, KS. The key to having a successful garden is to choose plants that match the site's sun and moisture characteristics. Plant sun loving plants in the sun while shade loving plants should be placed in areas that get shade for at least part of the day. My garden galleries are grouped according to the type of garden. The types represent a range of site characteristics. Prairie Garden Gallery contains sun loving plants. Woodland Garden Gallery contains shade or partial shade loving plants.